The Walking Dead #100 Midnight Release Party + IMAGE SALE!! Get the BIGGEST single comic of 2012 early by coming to our zombie party on TUESDAY, July 10th. Have all the gruesome, gory, gut-wrenching details spoiled for you by the populace at large. 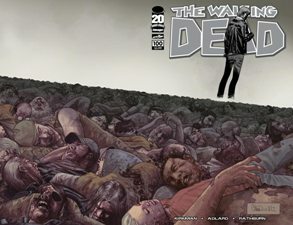 THE WALKING DEAD #100 MIDNIGHT RELEASE PARTY + IMAGE SALE! 25% OFF ALL Image Graphic Novels! 50% OFF ALL Image Back Issues! 25% OFF ALL Image Display Case Books! Each copy of TWD #100 you buy gets you ONE entry in your choice of door prizes! Come in zombie gear and get ANOTHER entry! TWD #100 Poster signed by Robert Kirkman and Charlie Adlard!